This post cover one of the advance topic like how to implement Mysql data with Morris.js Chart to make stylish chart by using PHP Script. In one of the our previous post in which we have seen how to use Google Chart Library with PHP and Mysql database. 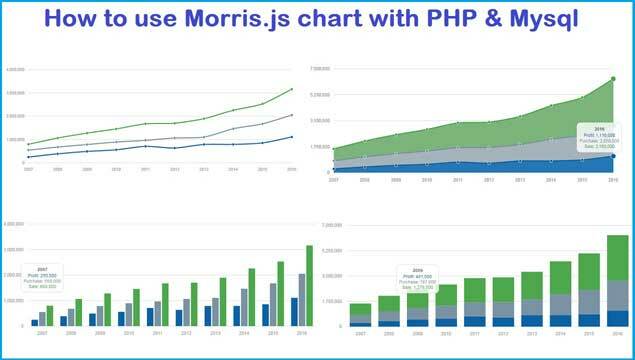 But now we have seen one more Chart library and how to use this Morris.js chart library with PHP and Mysql. In this post we will first make simple query and make data for Morris.js chart, based on that data we will make Line chart, Area chart, Bar chart and Bar chart with stacked option. For making this chart we have take data of last 10 years profit, purchase and sale data from Mysql table. After defining required CDN library link, we have create on division tag and we will display chart under this tag. After fetching data from Mysql table now we have write javscript code for load Morris.js chart library for different chart like Line chart, Area chart, Bar chart and Bar chart with stacked option. This is something new web tutorial make by Webslesson, with this post you can get source code of this tutorial and you can also get video tutorial on this topic also. i cant fetch datetime column from mysql. Appreciate a lot for help.